Most chemicals in their pure form have no use for household consumers. Other manufacturers purchase pure chemicals and make certain compositions that are useful for the consumer market. Before doing that, chemists need to test physical properties of all ingredients to determine if such a composition is possible and what should be the proper order of mixing the ingredients. For every solid ingredient, chemists may need to know the solubility, melting point, hardness, vapor pressure and conductivity. By learning about the relation between physical properties of a substance and its intermolecular bonding, you may be able to predict the physical properties of different substances just by knowing their chemical formula. Why different solids have different physical properties? 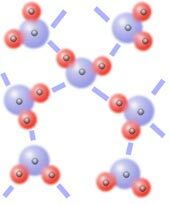 Does variation in physical properties such as solubility in water, conductivity and melting point have anything to do with the type of molecular bonds? In this project you will gather information and perform experiments to find out if molecular bonds (ionic, metallic, polar molecular, non-polar molecular and covalent network) have any relation with the physical properties of solids. More details or support for this project is available for the members of ScienceProject.com web site. Material needed for experiments can be found at home or purchased locally.